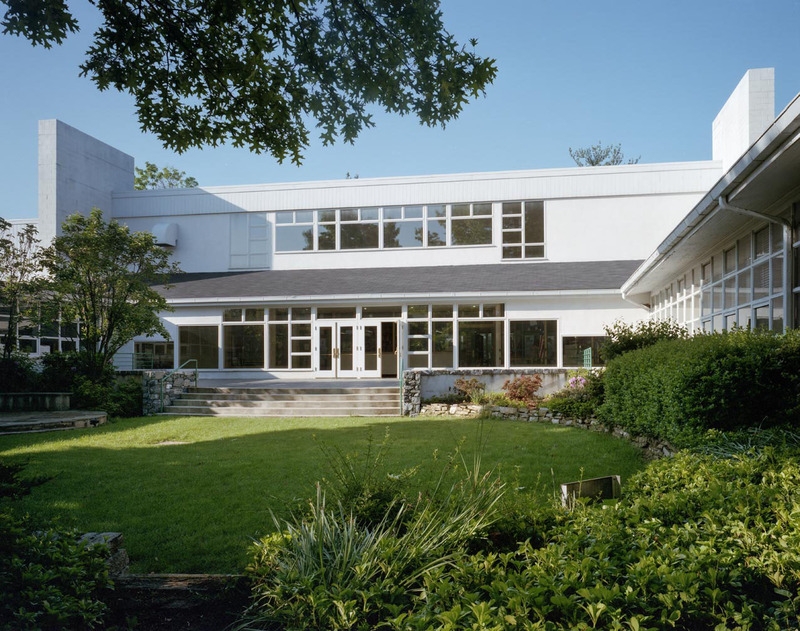 Among the three major projects we designed for Lancaster Country Day School is a library wing addition that connects the upper and lower school academic wings with the new lower school entrance. Placed away from the busy cafeteria, gym and theatre, the library and classrooms feature a roof design that captures daylight while providing views of the courtyard. By creating this new connecting wing, the two formerly separate buildings now have one continuous façade that looks as if it was part of the original plan. Illuminated by natural light from large walls of glass, pendant lights and recessed lighting, the library’s circulation desk provides the ideal work environment for staff. The sloped ceiling in light wood tones adds spaciousness and warmth to the main room. 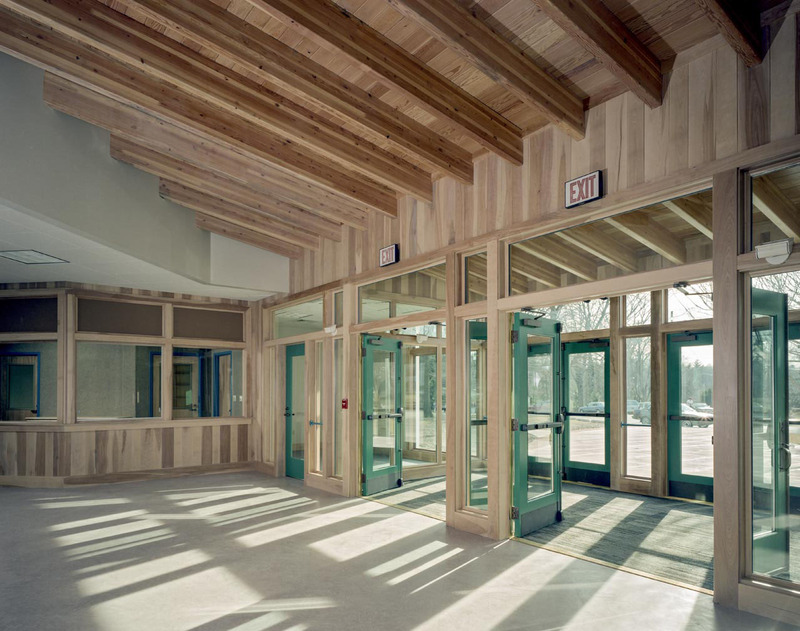 By using laminated wood joists similar to the library roof structure, the upper school foyer, vestibule, and reception area provide a harmonious overall design. Natural birch wall cladding offer richness and durability, and green and blue are used as accent colors throughout a series of projects for LCDS that span ten years. 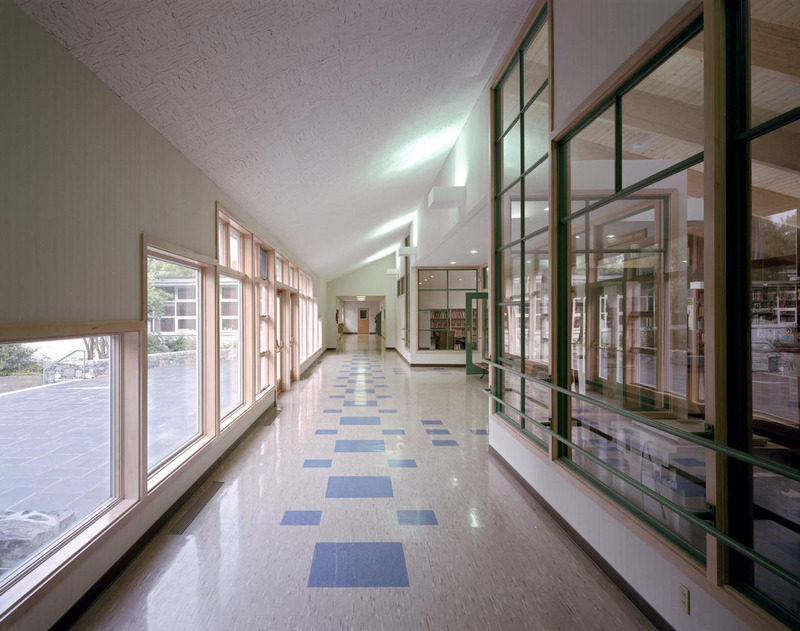 Fun colors, windows of varying heights and a playful floor pattern brighten the connecting corridor between the two schools. Upward lighting reflects into the space from the textured, angled ceiling to augment the natural light from the windows. The alcove entrance to the library is the focal point, connecting students to the library, even if they are just passing by. 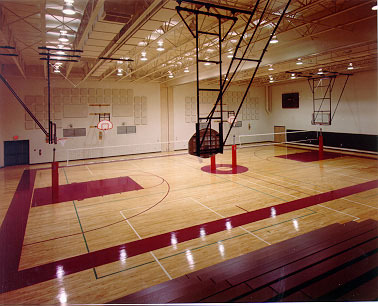 Nicknamed after the school mascot, the Cougar Dome is the new gymnasium addition which seats 500 people on folding bleachers. A folding panel center wall allows the space to be divided, with access to a large storage room for both areas. An acoustic structural roof deck and wall panels control sound in this energetic environment. Used to identify the upper school entrance, the school’s bell tower delivers the sound of sports team victories. 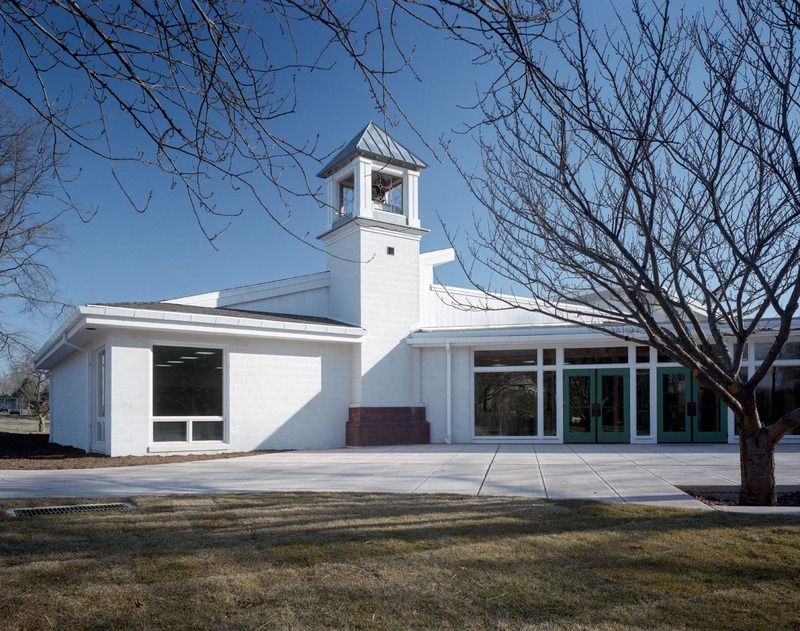 Low sloping roofs with clerestory windows are the primary design element throughout the schools many additions, and white tinted concrete blocks resulted in lower construction and maintenance costs. 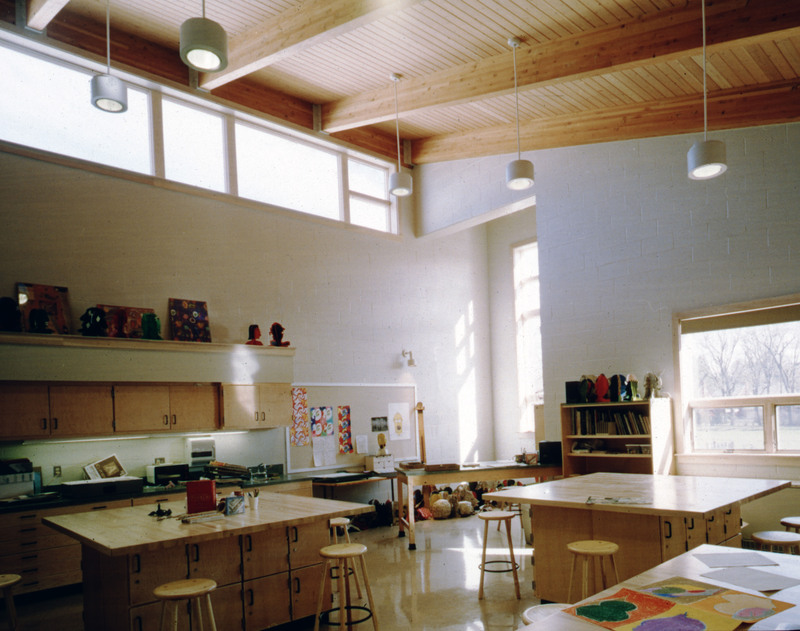 Providing plenty of space and soft, reflected light, the new art room addition is located on the second floor over a connector between the original theatre and the science wing we designed. 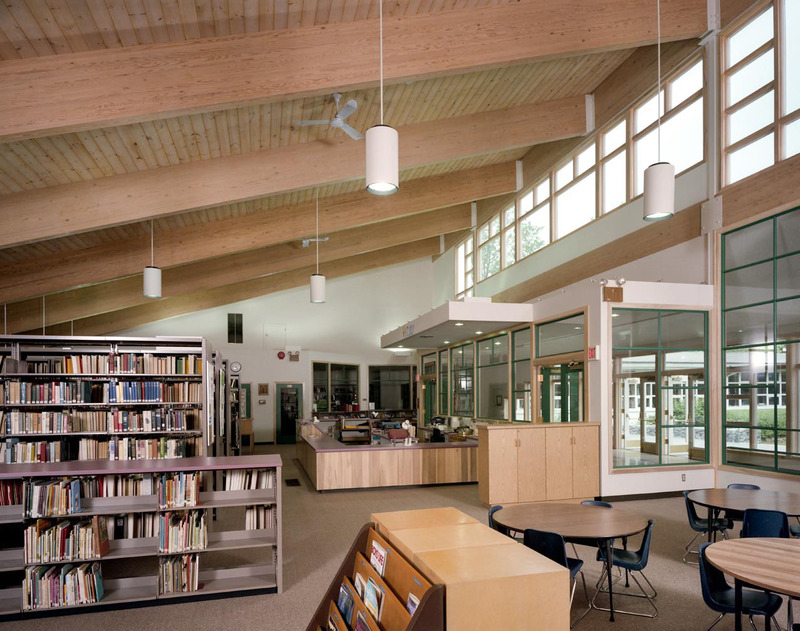 Using the same roof structure as was used in the library wing, we created an appealing, cohesive design. We also provided millwork and interior design for this inspiring creative space.